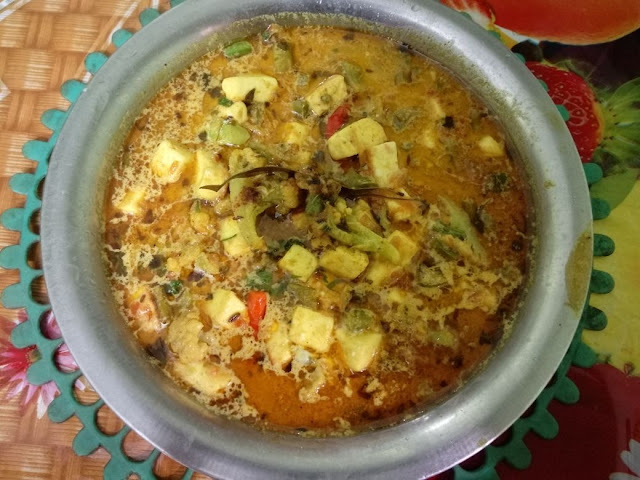 In this post I am going to share an authentic Bengali Paneer dish which I learn from my mother in law Mrs Mitra Sur. She is a wonderful cook. So I never leave a single chance to learn from her. If you try this dish I am sure that your taste buds will just rock. Cut the paneer into dices. Take out the seeds of tomato. Make a paste of tomato, chili, char- magaz and cashew together. Heat the non stick pan and add oil in it. Low the flame and put fry it but don't deep fry. Just saute it. Keep the paneer aside. Then blanch cauliflower and fry it lightly with capsicum and beans. Also keep them aside. Add cumin seed, bay leaf and garam masala to the remaining oil along with the tomato, chili, char- magaz and cashew paste. Cook them at low flame for few seconds. Then add all the vegetables, paneer and spices. Cook at high flame for two mins. After that add 1 cup of soya milk. Cook it at low flame for 3 mins. Make a paste of yogurt and cornflower with the remaining soya milk and add it. Turn off the burner and a top it with butter immediately. Serve hot along with roti or paratha. All Rights @ Bongjournal.com 2018. Powered by Blogger.